SEMrush is powerful, versatile and all things considered, remarkably accurate. With that being said, SEMrush’s advanced features can be both a gift and a curse. With advanced functionality often comes complexity and it’s fairly easy to get lost in SEMrush’s broad array of features. This guide will serve as a walk through of SEMrush’s most useful ones. I’ve broken the guide into five parts: organic rankings, keyword research, mobile user experience, competitor insights, and backlink data. Under these five topics, I’ve included how-tos on features in SEMrush to use in relation topic for your SEO endeavors. Many of the following processes rely on adding filters in SEMrush and many of these filters can be combined to achieve much more specific results. Filters are added on top of each other, so if two filters are applied, the results will meet the criteria for Filter 1 AND Filter 2, not Filter 1 OR Filter 2. In most cases you can change a filter from “include” to “exclude” and find the opposite of what you’re looking for. Any of this can be performed in Excel, but using SEMrush’s built-in functionality saves time and saves you from downloading enormous Excel files (which also preserves your download limit). 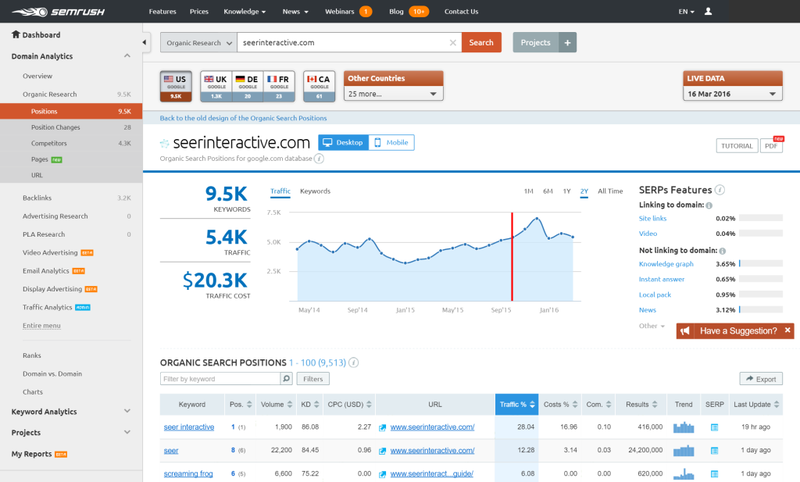 This section uses resources from SEMrush’s Organic Research tab. 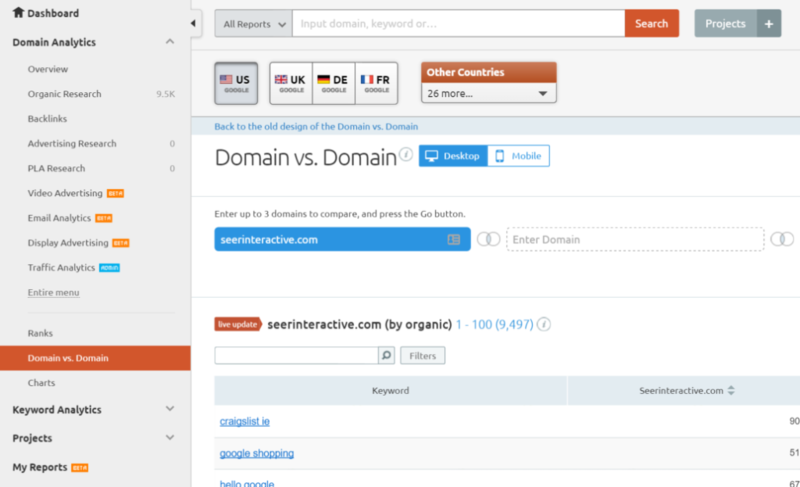 Enter the root domain into SEMrush’s search bar. Do not include “http://” or “www.” else SEMrush will default to rankings for that specific page (more on this in a bit). Click on the Organic Research sidebar, which defaults to the ‘Positions’ submenu. Scroll down to “Organic Search Positions” where you’ll see a comprehensive list of keywords, their search volumes, which of your pages rank and in what position (plus other relevant details). You could also create the filter Include > URL > Begins with > rcs. This would be less specific, but helpful if you wanted to find rankings for multiple subdomains that began with the same string of text. If your blog is located by itself on a subdomain, this is how you can find where your blog pages rank. In the search bar, enter the full page URL, including the HTTP prefix. SEMrush will recognize that you’ve entered a page URL and only show keywords/rankings for that URL. If you have multiple subfolders across different URL structures, you can use this method to find their rankings. Say you have seerinteractive.com/philly/seo/ and seerinteractive.com/san-diego/seo/ and you want to find rankings for pages in those seo subfolders, but you don’t want to include pages outside those folders that might have seo in the URL (such as seerinteractive.com/blog/seo-tips/). Unfortunately, SEMrush doesn’t display the HTTP prefix in their position results, and doesn’t allow you to filter via HTTP or HTTPS. However, when you export rankings into an Excel file, the URLs contain the HTTP header. If you have a domain with some HTTP and some HTTPS pages you’ll need to export into a spreadsheet and sort/filter by URL. Create two filters: Include > Pos. > Greater than > 10 and also Include > Pos. > Less than > 21. 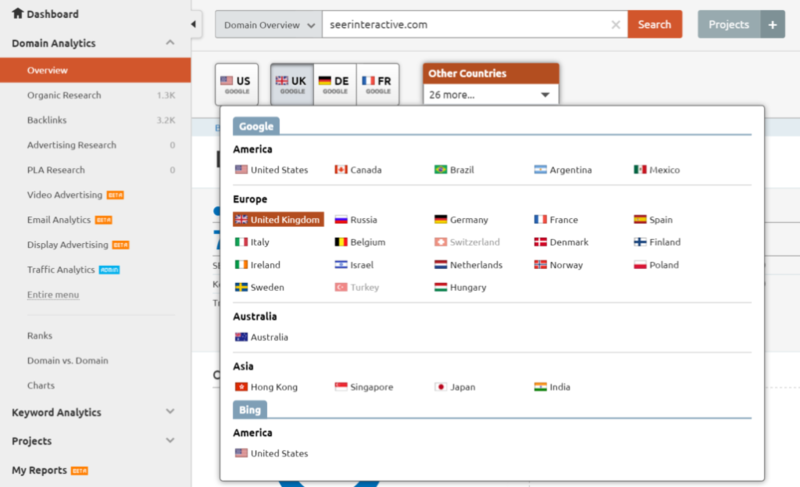 What’s VERY cool about SEMrush is that for international SEO, you can find any of this information for different Google databases. Up top, select one of 28 different countries to see different results. SEMrush also lets you find US-based Bing rankings, although I’m inclined to believe their Bing index pales in comparison to their Google index (understandable). 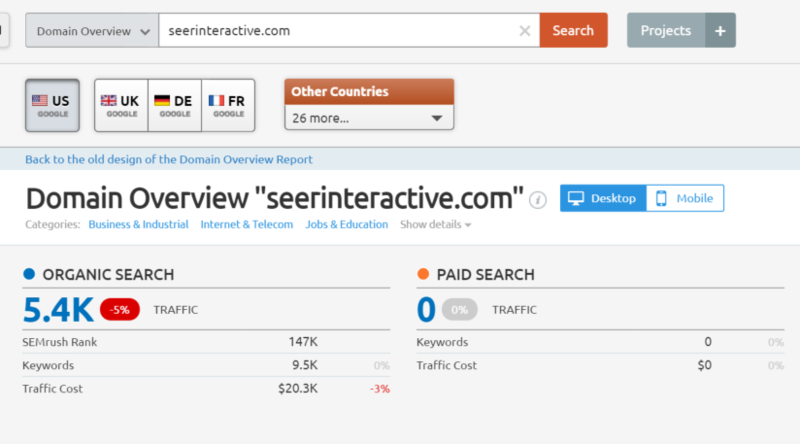 Per SEMrush, seerinteractive.com ranks for 10,781 keywords with Google US selected. Choosing Bing US indicates that it only ranks for 11 keywords. Suspect, indeed. In addition to current rankings, SEMrush will show you historical rankings as well. In the top right corner, click the drop down next to the date and pick any one of the last six months to see historical rankings. You can then easily export this data into a spreadsheet and use VLOOKUP to evaluate historical position changes. SEMrush will show you a site’s estimated organic traffic based on rankings, but I take this metric with a grain of salt. It is, at best, an approximation given the available data and should be treated as such. You can use this to evaluate a competitor’s potential traffic, but it’s more useful in terms of traffic trends – a big drop could indicate that a site was affected by an algorithm change. Gains could suggest that a site has put greater emphasis on their SEO efforts or launched new campaigns to rank higher or rank for more keywords. 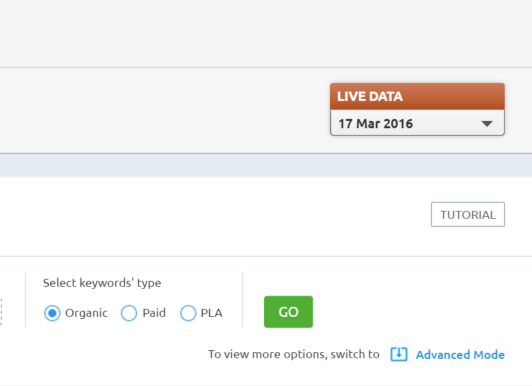 Type your desired keyword into the search bar up top and SEMrush will present detailed information about that keyword, including results 1-100. This will show you other keywords containing the keyword you entered. This is by no means highly conclusive, but can give you a good starting point. This is probably one of SEMrush’s least used features, but it’s easy to find keywords with a certain number of total search results. Create the filter: Include > Results > (Greater than|Less than|Equal) > 6,000,000 (or whatever number you want). Similar to URL, you can filter by keyword contents. You might want to find where a site ranks for queries containing the keyword “seo.” Create the filter: Include > Keyword > Word matching > seo. This ensures the results will only include strings where “seo” is present as its own word, and not as part of another word. If you want to be less specific, you can create the filter: Include > Keyword > Containing > seo. If you’re only interested in keywords with a certain monthly search volume, you can find those easily. Create the filter: Include > Volume > Equal > 18100. What other websites share common keywords. The percentage (and raw number) of keywords these other sites have in common. The total number of keywords other competitors rank for (including non-mutual keywords). Clicking on any of these results will take you to SEMrush’s Domain vs. Domain analysis tool. If you want to compare a website’s rankings to that of its competitors, Domain vs. Domain makes it very easy. This varies from the “Competitors” tab in that it allows you to select specific domains to compare. 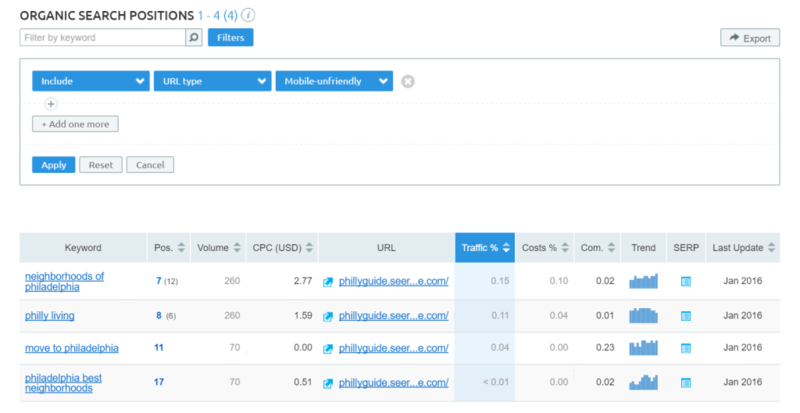 SEMrush will essentially perform a very basic gap analysis, identifying keywords where all of the domains rank, and reporting on what position each domain ranks in. It does not, however, tell you what URL is ranking for each domain, which makes it difficult to manually compare pages. In order to get a more in depth look, you can still use SEMrush but will need to export rankings for each of the domains and use spreadsheets and VLOOKUP to compare URLs. Find out how many of a domain’s pages are not mobile-friendly. With the mobile tab, you can find all the same data as desktop EXCEPT number of results, keyword type and category. The mobile tab adds one additional feature, which is the mobile-friendly designation. All of the following features are located under SEMrush’s Backlinks tab. Enter a site’s root domain into the search box and make sure the Root Domain box is selected below the search box. SEMrush will default to a snapshot overview page but by selecting the Backlinks submenu on the Backlinks sidebar you can see a full list of backlinks. This list operates similar to the Positions database and will find all of the backlinks to the root domain that SEMrush has in its index. By selecting the Domain box below the search bar, you can instruct SEMrush to exclude all subdomain backlinks. A word of caution: this will exclude backlinks to www. pages (since www. is a technically a subdomain). If you want to look at to a specific n subdomain, select the Domain box and enter that subdomain into the search bar. Do not include the HTTP header or SEMrush will default to backlinks for that specific page. Enter a specific page URL into the search bar. Including the HTTP header will instruct SEMrush to look at page-specific metrics. Within its list of backlinks, an interesting metric SEMrush provides is the number of internal and external links present on the source URL. A high volume of external links could be an indicator that the site is low-quality or directory-focused. A common obstacle with backlink indexes is that they’re sometimes out of date. The First Seen and Last Seen columns can be useful to determine the estimated age of a backlink, although it’s still wise to use Screaming Frog’s custom search feature to crawl a list of backlink source pages and see if they’re still present. Unfortunately SEMrush does not allow you to sort anchor text using a “Containing” parameter, as that would be more useful than an exact match in most cases. The best bet here is to export a full list of backlinks and sort/filter using Excel. Similar to image backlinks, you can create a filter for nofollow links, although you’ll probably want to exclude them. Create the filter: Exclude: Type > Nofollow. If you want to evaluate backlinks from a specific domain, create the filter: Include > Referring Domain > Exactly Matching > moz.com. You might also want to find backlinks from foreign sites for international SEO. Create the same filter and choose the country-based suffix of your choice! The country where the IP address is located (plus an overview of how many referring domains are in each country). In the Referring IPs report, you can click on a specific IP address which will take you back to the general Backlinks report, with a preset filter for that IP address. Here’s another very helpful feature. Sitewide (header, footer or sidebar placed) backlinks are going to clog up your backlink report if you export every single instance of them. Opt to exclude them using this filter: Exclude > Type > Sitewide. Under the “Backlinks Comparison” tab you can again enter 5 domains of your choosing and compare basic metrics about their backlink profiles. This will give you a quick overview of how competitors stack up according to SEMrush’s pre-selected metrics (it’s even color-coded red and green to show you the winners and losers in each category). However, if you really want to produce a comprehensive analysis, you’re better off to export backlink full data for each competitor and use spreadsheets and VLOOKUP to dig deeper. What are your favorite features in SEMrush? Share in the comments below, or send me a tweet @BerkleyBikes. Wil hand-selected a few follow-up reads for you. This is related content from our site (and others) that we think will help. Looking for some other digital marketing tools?